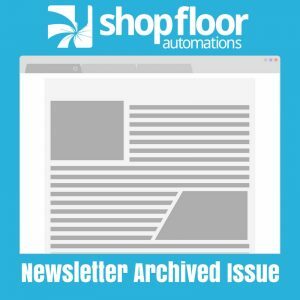 The following is an archived copy of the Shop Floor Automations Newsletter from August 2012. Book your installations and service for the 4thQuarter soon! Frequently after a large tradeshow, we get really busy. Please plan ahead for your year-end budgets so that we can meet your needs for 2012. Be sure to sign up for our promotions and end of year clearance on hardware as we close out our inventory levels. Special bundle pricing will happen immediately after the show on software and hardware packages, so be sure to ask your Account Executive. It seems to happen to all of us. The CNC machines are making chips and the parts are on schedule when, all of the sudden, the operator notifies you he cannot transfer the NC program into the machine for the last operation. He tried several times, checked the cable, reset the hardware and is still unsuccessful. The PC crashed and IT department has to order a new power supply, which is 3 days out. Now what?? The rugged, portable, USB Connect is a great solution to interface to any CNC to transfer NC programs or drip-feed large programs using any brand or size USB flash drive. The LCD display allows the operator to quickly select the file, and load the program into the controller with the supplied RS232 cable. The unit can be configured for multiple baud rates, flow control and parameters to store a variety of machine configurations. When the PC crashes, this unit can be the lifeline between production and downtime. Are you prepared? The Predator CNC Editor Light can be installed on an unlimited number of PCs for editing, saving and printing of G-Code programs. You can download a copy from our website for FREE and register the product at no charge to help improve editing files over using Windows Notepad. The CNC Editor integrates with all CAM systems and a great tool for the shop floor or programming office.